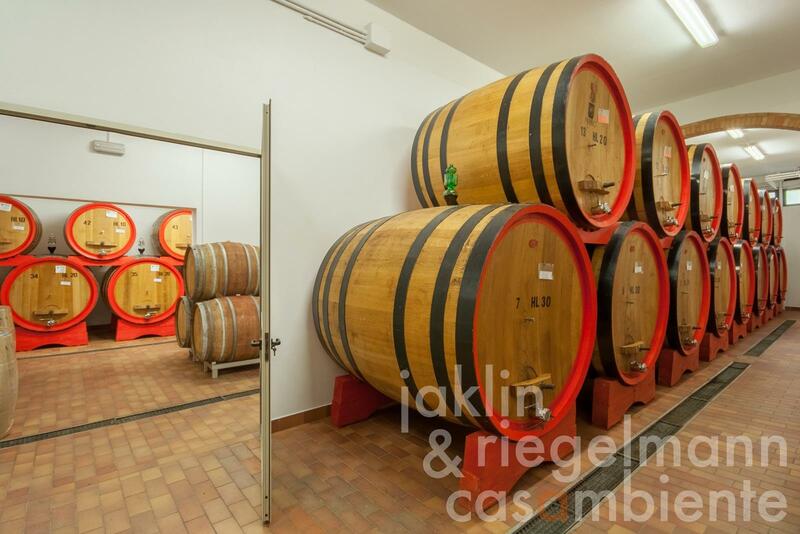 This Brunello di Montalcino DOCG winery for sale contains about 20 hectares of selected land with are 16.5 hectares vineyards, of which are approx. 7.5 hectares Brunello di Montalcino DOCG, the rest are Rosso di Montalcino DOCG and IGT. The winery is recognised as one of the best Brunello producers and is internationally honoured with accolades from all across the international wine media such as the Wine Spectator, Robert Parker and Decanter as well as Gambero Rosso, Veronelli and Luca Maroni. The winery actually produces approx. 90,000 bottles annually. The estate was built in the second half of the 19th century. The property is located close to Montalcino surrounded by woods, vineyards and olive trees. The estate contains the administrative buildings, the showroom, a cellar containing the wood barrels and a private house. Italy, region Tuscany, province Siena, municipality Montalcino. 20 ha with approx. 16.5 hectares of vineyards. Electricity, mains water, own well water, central heating, fireplace, gas tank, telephone, broadband internet access, satellite-TV, private parking, terrace, vineyard, olive grove.